As a Photoshop instructor, one common complaint I get a lot from older photographers is that their digital images just don’t have the “snap” and “color” of their film images. In the days of yore when we shot only with film, we would sometimes even pick up certain brands of film for those special looks. In fact, it was said that if you wanted good-looking portraits, you used Kodak. For landscapes, it was Fuji film. With today’s digital cameras you no longer have different films, but you can still get just the look you want – either by using the dialed-in settings on your digital camera or by using Photoshop© to enhance your images. Or both! If you have a point-and-shoot or even a DSLR camera, you can usually go to Menu > Picture Style. These are special settings with names like Landscape, Portrait, Fireworks, Outdoor, and the like. By picking one of these settings, your images will have some in-camera pre-processing done to make them just a bit “snappier.” Some settings increase saturation, while others might increase the sharpness. To be sure about what each setting does, you might have to dig up the book that came with the camera, or just experiment with each setting to see which ones you like best. Another setting in the camera that might help is the White Balance. A lot of cameras default to AWB, or Auto White Balance. This is where the camera tries to figure out the correct color setting for each shot, and 8 out of 10 times it does a pretty good job. 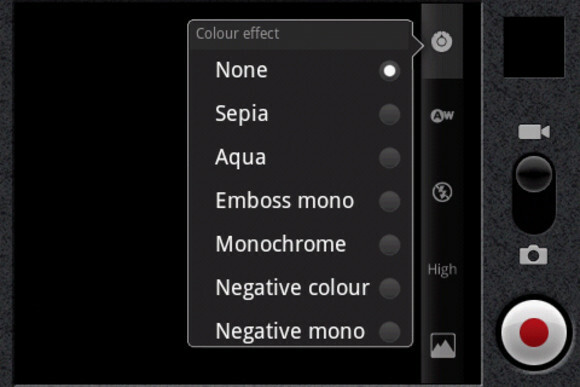 But if you want more control, you can set the White Balance yourself either through the menu or from other buttons on your camera. Some of the other settings are Shade, Cloudy, Sunshine, Fluorescent, and the like. These settings give more control and sometimes even a more creative looks. Shade and Cloudy will give a warmer look, even in full sun. Just remember to always check your White Balance setting before taking a shot since the camera will remember the last setting that it was on. Now let’s look at what you can do once you have taken the photo and have opened it in Adobe Photoshop. 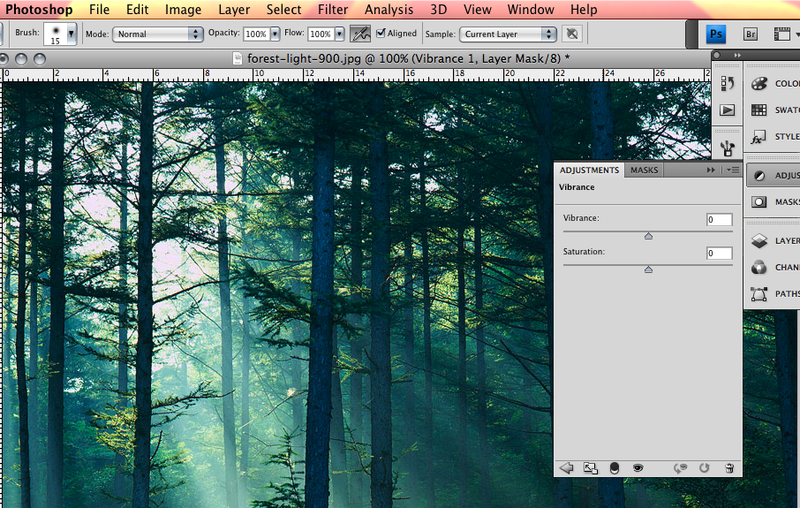 One of the easiest ways to “punch up” an image is with saturation. I like to use Adjustment Layers since they allow readjustments and will help you avoid that “Oh shoot, I wish I could change that back” scenario. 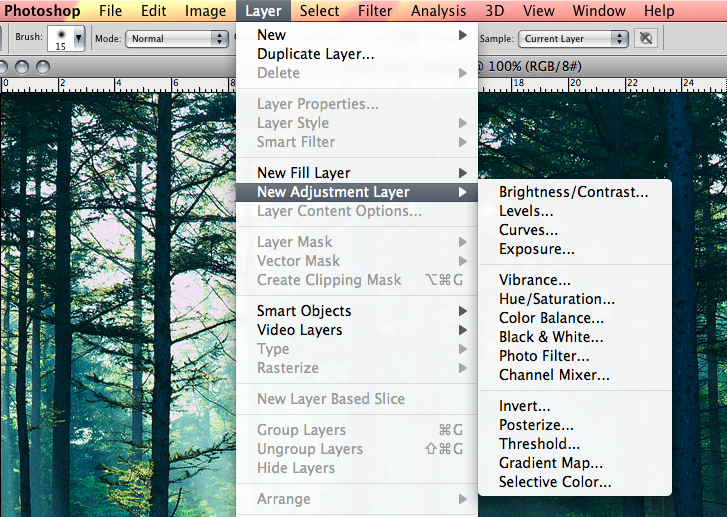 Just go to Layer>Adjustment Layer to find this option. Here you will find an Adjustment Layer titled Vibrance – let’s try that one first. 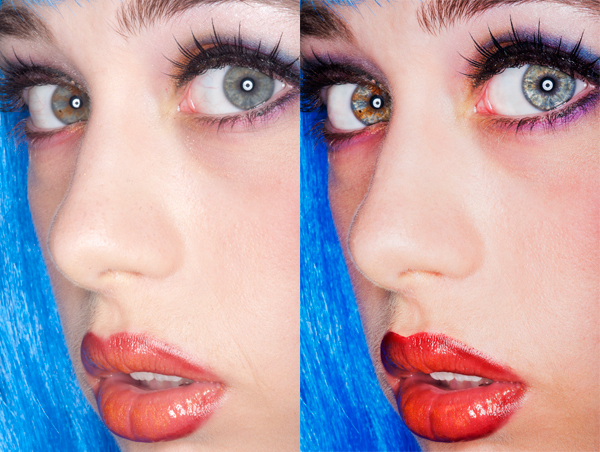 The Vibrance Adjustment Layer is made up of two sliders: one for Vibrance and one for Saturation. Vibrance will punch up the image’s dull colors, leaving the more saturated colors alone for a while. Saturation will saturate all of the colors at the same time. I like to start with the Vibrance slider because it does a great job of subtly increasing color. All of this is visual, so you’ll need to use your best judgment to create an image that “pops” for you. If you are an old Fuji fan, increase the Saturation slider to +5 for that familiar Fuji look. Play with these sliders to your heart’s content – they’re not hurting the background image below. Once you have the color how you like it, it’s time for the “snap” – or sharpening – needed. 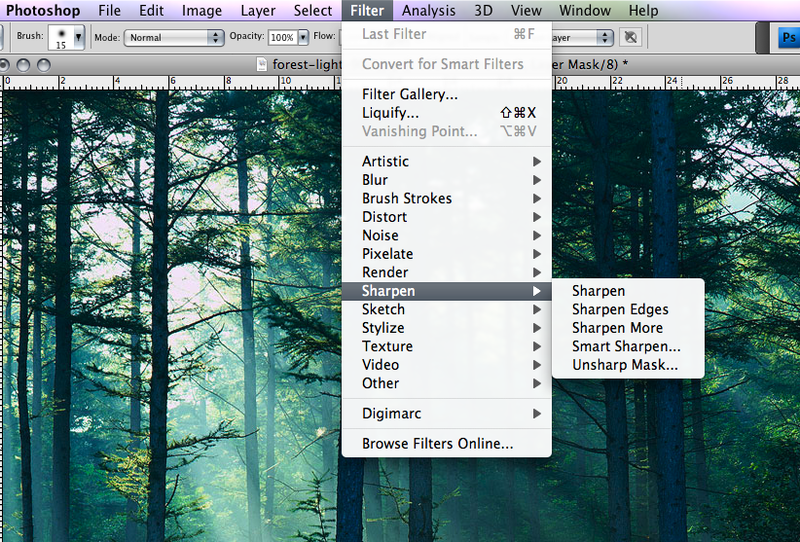 Before you can sharpen an image in Photoshop, you have to flatten the image. First, however, be sure to “Save As” the image under a different name so that you can keep the original, un-flattened image. Once an image has been flattened you can no longer access it’s layers, so this will be the last step you’ll want to do on your images. You can flatten the image by using the keyboard shortcut of Ctrl + E (for Mac it is Command + E), or you can use power Photoshop tip of going to the top of your layer pallet and pressing Crtl + Alt + Shift + E (for Mac it is Command + Option + Shift + E). This second (and harder to remember) keyboard shortcut will make a new layer with all of the layers merged into a new image layer. This is a nice option for keeping all the layers in case you want to go back to them later. On either this new layer or the flattened layer, you are going to add some sharpness to the image. Digital cameras tend to give a slightly soft image to retain all the colors and textures, so we always need to add some sharpness back to the final image. To sharpen, go to Filter>Sharpen>Unsharp Mask (the name doesn’t make very much sense, but it is hold-over from the days of press printing). The default setting for the Unsharp Mask is normally about 100% for Amount, with a Radius of 1 pixel. Move the Amount slider until your image looks a bit sharper, but watch out for “halos,” or white edges around strong contrast areas. Got a look you like? You’re done! Have fun and keep shooting.